Journal of Agricultural Science and Food Research provide the Triannual publication of articles in all areas related to farming, Integrated pest management, Irrigation, fertilizers, pesticides, Pesticides and toxicity, Organic pesticides, Earthworms and farming, Fungal bio pesticides, Nematode pesticides, Organic fertilizer, Bacteriophages, Viral bio pesticides. 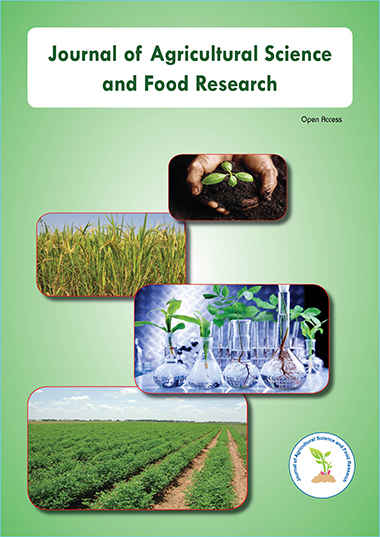 Journal of Agricultural Science and Food Research Welcomes the submission of manuscripts that meet the general criteria of significance and scientific excellence. Papers will be published approximately quarterly after acceptance. As a member of Publisher International linking Association, PILA, Journal of Agricultural Science and Food Research (of Longdom Publishing) follows the Creative Commons Attribution License and Scholars Open Access publishing policies. The Journal of Agricultural Science and Food Research is using Editorial Manager System for online manuscript submission, review and tracking. Editorial board members of the journal or outside experts review manuscripts; at least two independent reviewers approval followed by the editor is required for the acceptance and publication of any citable manuscript. Longdom Publishing will support authors by posting the published version of articles by NIH grant-holders to PubMed Central immediately after publication. Journal of Agricultural Science and Food Research follows a progressive editorial policy that encourages researchers to submit the original research, reviews and editorial observations as articles, well supported by tables and graphic representation. Note: Its Authors sole responsibility for any scientific misconduct including plagiarism in their research articles. Publisher is not responsible for any scientific misconduct in any published research article. However as a publisher Longdomwill follow strict scientific guidelines and EIC’s advice to retract or erratum of any article at any time if found scientific misconduct or errors in any articles. Journal of Agricultural Science and Food Research is organized by Longdom Publishing, a self supporting organization and does not receive funding from any institution/government. Hence, the operation of the Journal is solely financed by the handling fees received from authors and some academic/corporate sponsors. The handling fees are required to meet maintenance of the journal. Being an Open Access Journal, Journal of Agricultural Science and Food Research does not receive payment for subscription, as the articles are freely accessible over the internet. Authors of articles are required to pay a fair handling fee for processing their articles. However, there are no submission charges. Authors are required to make payment only after their manuscript has been accepted for publication. Reviews: comprehensive, authoritative descriptions of any subject within the scope of the journal. These articles are usually written by experts in the field who have been invited by the Editorial Board. For more information on each type of article, please contact the Editor at [email protected]. A list of acceptable file formats appears below. Additional files of any type, such as movies, animations or original data files can also be submitted as part of the manuscript. Figures must be sent separately, not embedded in the main manuscript. Longdom Publishing S.L. will not edit submitted manuscripts language; thus, reviewers may advise rejection of a manuscript due to grammatical errors. Authors are advised to write clearly and simply, and to have their article checked by colleagues before submission. In-house copyediting will be minimal. Non-native speakers of English may choose to make use of our copyediting services. Please contact [email protected] for more information. Abbreviations should be used as sparingly as possible and should be defined when first used. As a member of Publisher International Linking Association, PILA, Journal of Steroids & Hormonal Science follows the Creative Commons Attribution License and Scholars Open Access publishing policies. All works published by Journal of Steroids & Hormonal Science are under the terms of the Creative Commons Attribution License. This permits anyone to copy, distribute, transmit and adapt the work provided the original work and source is appropriately cited.